Cant find the answer below? Slow Feed Hay Nets Discovered…..
Why use a slow feed hay net? – Ulcers – As a horse chews they produce saliva which buffers the acid in the stomach. Feeding hay from a Just Grazin Custom Net® slow feed hay net means horses take smaller mouthfuls. They also chew for longer, producing more acid neutralizing saliva. – Colic & Choke – Using a slow feed hay net means horses can only take small amounts of feed at a time, preventing them from gorging their food. Consumption is slowed therefore reducing the risk of colic and choke. – Using a Just Grazin Custom Net® slows down the amount of hay consumed per minute. Plus the nets mean hay can be on offer free choice 24/7 (if enough hay and nets are supplied) for continuous slow feeding. – Allowing horses to eat continuously has metabolic and other health benefits. Providing food in just a few meals rather than spread out evenly can result in higher insulin responses to feeding. Horses with metabolic issues (Metabolic Conditions, Cushings, Insulin Resistance, Hypothyroidism & Laminitis) benefit when they eat small amounts on a continuous basis. – We donated a hay net to a horse who had broken his knee in a freak paddock accident. Due to the severity of the injury he was on strict stable rest, in cross ties, while his leg was in plaster. His owner noticed a big change in his attitude once she started using our slow feed hay net. He became calmer, more settled, taking all day to eat his hay instead of just a couple of hours. While she can no longer compete with him, thankfully he is now paddock sound! …..”I am loving these Just Grazin Custom Hay Nets – thank you so much. I have one with grassy hay, the other with lucerne, tied next to Dibby who has to remain cross tied in the stable with his leg cast on, and they are fantastic. Instead of just pigging out quickly on his hay and then standing for hours without feed before his next meal, I just load three big biscuits in each (room for more) and he is nibbling away constantly like a horse that is grazing rather than eating fast then having nothing left. There is always hay there for him and they are keeping him entertained as well. Great products and highly recommended!!”….. – Leanne Owens – Horses of Gold. – Tired of your hay being spread around the paddock/stable, trampled and urinated on or simply blown away on those windy days. Using a Just Grazin Custom Net® keeps the hay contained, reducing waste and saving your money! – Horses will naturally graze approx 18-20hrs a day. Unfortunately not everyone has access to large grassy paddocks, or horses who can be on pasture 24/7, due to laminitis etc. “Grazin” from our slow feed hay nets simulates natural grazing, which is beneficial to the horses mental and physical health. ​– We’ve all seen our horses (or photos of horses) with their heads buried deep down inside a round bale. Apparently the hay always tastes better from the middle of the bale, haha. This is the prime time for an eye injury, with a piece of hay easily spiking into your horses eye. Using a Just Grazin Custom Net® prevents horses from getting their heads too far into their round bales. 3cm, 4cm or 6cm Netting? Is your horse a pro at using a slow feeder and you find the traditional 4cm netting is just not quite small enough? Do you have laminitic ponies, own mini’s or do you feed out top quality leafy hay? 3cm x 3cm netting is recommended for animals who are experienced with using slow feed hay nets or for use with mini’s, goats, sheep etc. This size netting is best used with high quality leafy hay, the type of hay your horse/animals usually eat fast. Be mindful though, that some horses may be frustrated by this size if they aren’t conditioned to using a slow feed hay net, others are happy to graze from the net straight away with no worries. Our 3cm netting range is available in 48ply netting, black in colour. 4cm x 4cm is the traditional netting size most commonly used for slow feeding hay. This is our most popular netting as its a good general purpose netting size suitable for the majority of hay types. The perfect size for reducing hay waste as well as slowing consumption when using good quality hay. All of our 4cm nets are made with a robust 60ply netting, green in colour. Are you sick and tired of your hay being spread around and wasted? 6cm x 6cm netting is ideal for those who mainly want to stop their horses wasting so much hay. It does slow consumption, but not as much as 3cm or 4cm netting. Suited to all types of hay. including hay of lower quality & cereal hays. This size is also a great choice for old or retired horses, it wont restrict their forage intake too much, but will save you $ on waste. All of our 6cm netting is a robust 60ply netting, black in colour. ​NOTE: Prior to use, be sure your horses hooves are larger than the size of the netting. 6cm netting is not recommended for foals or mini’s due to their small feet. If using with small footed animals, you must ensure their feet cannot access the net as there is a chance they may become tangled. Please read our FAQ’s for ideas on using slow feed hay nets with shod/small footed animals. What size net will suit my needs? Back in 2015 we increased the size of our nets, they are generous for easy filling. Small – 1-3 biscuits of hay, great for pony’s, trips away to competitions & shows or for feeding your horse’s lucerne ration. Half Bale – Great for multiple horses (who’ll share) or to have grassy hay available all day for your horse. Full Bale – Fits a full standard bale of hay. Perfect for continuous slow feeding, keeping hay available to your horse/s 24/7. Round Bale – Standard sizes 3×4, 4×4, 5×4 & 6×4. XL Square – Suitable for the big XL export size bales. Mineral/Salt Licks – Suitable for keeping mineral blocks/salt licks out of the dirt. Custom – Any size, made to your measurements! Contact us for a quote. Can I get an extra long drawstring on my net? Yes! If you require a longer draw string, simply shoot us a message with the length of drawstring you need! Alternately, tie a piece of bailing twine around where your wanting to hang your hay net and then you can tie the drawstring to the bailing twine. Can my hay net be used at ground level? Certainly can! Fill your new hay net, then untie the knot at the end of the draw string, retie the knot right up at the net, so that the 2 tails of the draw string are free. That way your horse cant get their leg caught in the drawstring when feeding from ground level. Your hay net can then just be thrown into the paddock for the horses to graze from! If your horse is shod (or has badly split hooves) the net can still be fed at ground level, but must be contained inside a wooden box/hay hut or in some way that they cannot access the net with their hooves. *Shod horses may become tangled in the netting if their hooves can reach the net. Am I able to place a special order? We are happy to create any size net,just for you! For custom orders simply supply us with your measurements/what you require and we’ll make the net to your specifications! This is a service we offer, free of charge! My horse has shoes on, can I still use a slow feed hay net? Yes, a slow feed hay net can be used with shod horses. However extra care needs to be taken that the horses shoes do not have access to the netting. For example……..The net must be secured either; inside a hay feeder (in a style that the bottom half is fully enclosed), used inside a Hay Hut, secured inside a wooden box/crate or tractor tyre or for smaller size nets, they must be hung at a height out of the reach of your horses hooves. An information sheet re use with shod horses will be included with your order. How should I introduce my horse to a slow feed hay net? When you first introduce your horse to a slow feed hay net, you need to give them time to become accustomed to grazin from the net. Make sure you provide a good portion of their hay ration in the usual way you used to feed it out, and continue to do so until your horse is comfortable grazin from the net. If using a round bale, you can just open the net and pull some out for them to feed loose. If a horse is really hungry when introduced to the net, they can become frustrated which may lead to them damaging the net. Its best animals have easy access to some hay/feed while they explore the net and learn to graze from it. Yes. You are more than welcome to pick up your order direct from us in Sarina Qld. When placing your order, select “pick up”, then simply wait for your pick up confirmation email, along with instructions. If you havent received your pick up email within 48hrs, be sure to contact us! What are the nets made of? Just Grazin Custom Nets® are made from heavy duty polyethylene netting, which has been UV treated for longevity. The netting comes in either 48ply (3cm netting) or the more durable 60ply (4cm & 6cm). The 3cm netting will stay at 48ply, due to the fact that if we increase it to 60ply, it will close up the holes too much and we feel the nets will become too difficult and frustrating for the horses to use. The netting is durable, hard wearing and it does not absorb/hold water, so is not affected by wet weather and also makes it suitable for soaking hay. To return your item it must be unused, in the same condition and original packaging and be returned within 7 days. *Unfortunately due to disease control and hygiene reasons, we are unable to accept returns on used items. To return your item, please email us info@justgrazincustomnets.com to make arrangements PRIOR to returning your item. You will be responsible for all shipping costs incurred, shipping costs are non-refundable. If you are returning an item you should consider using a trackable shipping service or purchasing shipping insurance. In the case of a return going missing in transit Just Grazin Custom Nets® can not be held responsible for missing returns during transit. Once your return has been received and inspected, we will notify you of the approval or rejection of your refund. If approved, you will be refunded and a credit will automatically be applied to your original method of payment. Refunds may take several days to a week to be cleared. We can only replace items if they are proven to be defective or damaged upon arrival. If you need to exchange, send through an email to info@justgrazincustomnets.com for exchange instructions. My horse doesnt seem to like grazin from the net? Introducing the hay net to your horse the correct way is important. Hungry horses may become frustrated trying to get the hay from the net, if they arent used to pulling it from small holes. 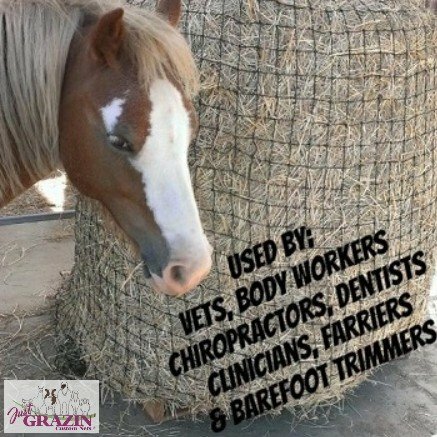 Loose hay needs to be provided in the way you would normally feed it, while your horse explores the net and learns to graze from it. Using leafy palatable hay in the net while your horse learns, will encourage them to try and get the hay from the net. Be sure you dont start off with too small a hole size, we dont recommend horses start off straight away with a 3cm net. Each and every horse is different in the way they respond to their first experience with a slow feed hay net, some pick it up super quick, others take some time to work things out. Palatability of the hay supplied is also a big factor, the more incentive they have ie – lucerne hay, the more they’ll try. Quality of hay is also a factor, if hay is stalky it can be considerably harder to get from the net, causing horses to become frustrated and quit trying, in which case the 6cm netting might be better suited to that quality hay.